Sarah Palin…I must say I was first shocked. I didnt’ think it would happen. I knew she was under consideration. So, okay. That’s the word. I had told Ray that we would meet for dessert at 7. At the time, I thought that we would be in our hotel and done taking a nap. I thought that we would have gotten up earlier and gone out to explore the town and have had dinner already. Things had not turned out the way I expected. I woke up about 6, and Chris was still fast asleep. I read some to let him keep sleeping. But I was concerned about being late. And we were supposed to eat dinner FIRST. But Chris was tired, and still sleeping. This seemed like a cool place. Naturally, it wasn’t there when I lived there. That photo is from deep January, and they never look like that. 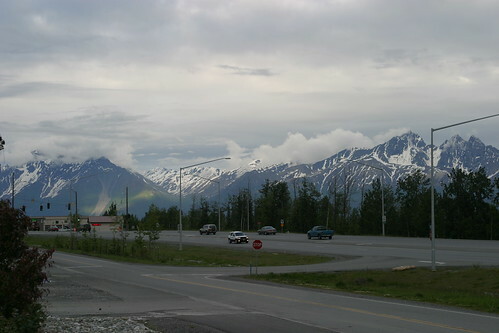 The one thing Alaska is good at, that Wasilla is really good at, is mountains. But it was time for dinner. So, the one thing I had actually planned for a time on this trip was to meet a friend from college. I’ve been talking about all the things I remember from when I lived in Alaska. And you might well imagine that there were people involved in some of these memories. But these people, on the whole, were not people I wanted to see again. 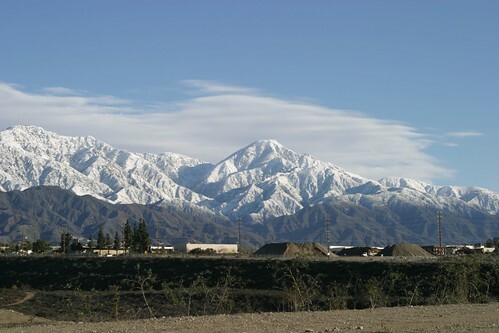 I moved (back) to Alaska with my parents when I was 11. Yes, I had been born there. And I lived there until I was 7. 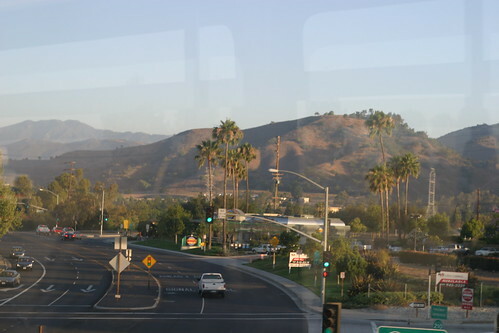 At that point, my parents joined a group of people who felt ‘called’ to establish a church in Humbolt County, California. So we moved down to Hippie Central, California and established a church for four years. But then, things didn’t work out, in a way that was unfortunately painful to my parents. And their impulse, when thinking of where to hole up and lick their wounds, was Alaska. So, they packed up us kids into a VW van and drove up the Al-Can to re-establish their family in the 49th state. Which led me to re-experience Alaska anew as an 11-year-old. 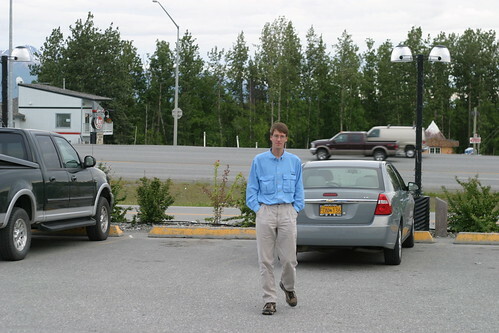 And eventually led to my parents’ decision to live in the city of Alaskan strip mall, Wasilla. And it was there that the personal tragedy of Home Schooling took hold. However, I do remember being really really pleased with my first year of college. 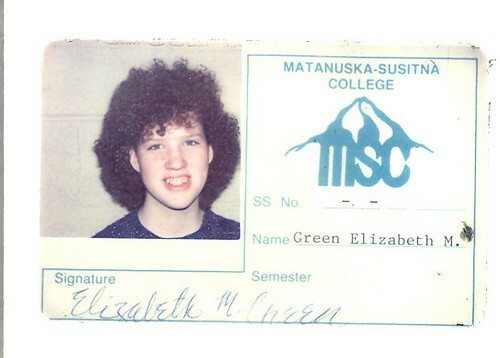 First semester of college, 1990, in Mat-Su Community College. Now, I can see I was a rank Noob about the whole thing. I had found high school to be thoughtlessly easy. Yeah, I had to study, but nothing that required any more attention than I usually gave to whatever novel I was reading. And homeschool was an entirely part-time endeavor. Start at 9, done at noon. COLLEGE, though, that was the desired and feared obstacle at the end of the prison of homeschooled high school. I had the impression that college was hard and that it was serious and that I would have to work at it. And that if I screwed up in college it would be unsalvageable. On my permanent record. After all, not only was college work supposedly harder than anything I’d done in High School, it was also the den of Satan where I would fall into the clutches of secular humanists and Evolutionists. I had my doubts about that, but that idea had been expounded from so many sides for so long, I couldn’t entirely dismiss it. So, in cautious preparation, I informed my mother that I would be taking the minimum of courses the first semester. The math went like this: 12 credits was technically a full-time student for the purposes of the Pell Grant, my educational sponsor. But for the first time, I wanted to make sure I wouldn’t screw it up. I wasn’t going to go full-time. Just 9 units for me, and I would fully fund it. Note the tufts of curly hair sticking out of my quasi-fro. It’s as if I were a fledgling bird moulting the last baby feathers. Those were simpler times. 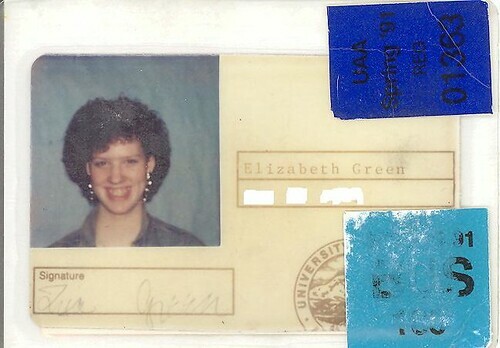 The blurred-out section in these college IDs was where the authorities had put my social security number. The WHOLE THING! Anyway, the first semester of college was fantastic. I learned things, I spent time around other people and life was exciting. Fact was, Ray was super cool. He was simply too much fun to talk to. The females in the class terrified me. They seemed to be blonde, eyelinered, and hairsprayed within an inch of the planets ozone depletion. And Ray was interesting, full of dry humor and snarky comments. Truly, now that I think about it, he may have been the very first guy to introduce me to my life-long preference for the companionship of smart nerdy men. Girls I can take or leave, but put me next to a smart nerdy guy, and I’m immediately charmed. So Ray and I hung out and talked during the breaks of typing class. And often, after class was over, we’d walk together to the computer lab. I was taking a computer class too. The computer class was definitely the most challenging class. I wish I had worked harder at it. But the nice men in the computer lab were so helpful I left that class having turned in very little of my own work. I wanted to understand what the class was teaching, but the guys explained the concepts by showing me how to do it, and before I knew it they had DONE the work and were saying “See?” Only I didn’t really. But the homework was done and I got an A. Personal nerdom was yet to come. Anyway, Ray and I kept in touch over the years through email and IMming. I hadn’t really kept in touch with anybody else from college. So, this first night, I wanted to see Ray again face to face and catch up–holy god, EIGHTEEN YEARS after we first met. 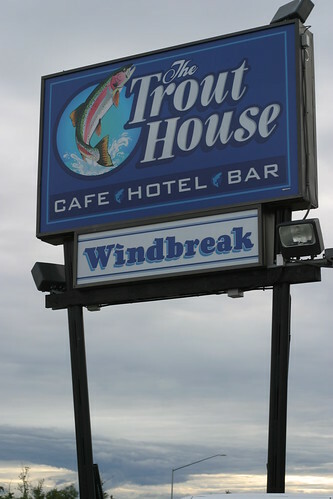 We’d arranged to meet at the Trout House, a cafe that had not existed when I lived in Wasilla. He’d bring along his wife, and Chris would get to come too. As long as we woke up on time. Back to Bogard road and our hotel and pending BED. We got in and the young lady who was running the hotel was behind. But she kindly gave us a room that was ready to be occupied instead of the one the computer had assigned us. A key…metal and on a chain…was given to us and we entered our room rolling our bags behind us. The room was better than I would have thought. We had a whole little kitchen, fridge, oven and all. “Why would you need three closets?” he wondered. Chris, my clean-cat husband, went to shower after the world’s longest day. I collapsed on the bed. The joy of soft horizontality seeped into my muscles and bones for a good ten minutes. Then I realized my skin needed a rest too, and I hoisted my weary bones up to find my satin jammies. THEN, approximately 30 hours since I last slept in a bed, I fell wholly asleep. So, I feel like cooking. They say that pregnancy makes you feel like nesting, and that may have something to do with it. But pregnancy is a great guilt reliever when it comes to dieting or discipline with food moderation. I get to eat! My huge hips are GOOD all of a sudden. So, I now would like too cook all those forbidden things that I normally avoid on my usual constant diet. Perhaps I should venture into homemade macaroni and cheese. I could get really good at that in the next few months. Who DOESN”T like mac ‘n’ cheese? and for the next couple months, it is a permitted food. The oven has been temperamental since we moved in here. Mostly, we use the oven to reconstitute frozen pizza, so it hasn’t hampered our lifestyle too much. It gets in the way if we ever want to host a meal here. So, mostly we don’t. But! I want to cook, already. I should just call a repair man and have him fix it. I’d LOVE to have some popovers. “So where do you want to eat?” Chris asked. After the longest day of my life, spent mostly in the rain, all I wanted was a bowl of chicken soup. But i knew Chris would want a hamburger. Freaky thought that Wasilla has a Carl’s Jr. But that was a good idea. He could have his hamburger and I could join him with the soup. “Can you make it across the parking lot?” He was makign sure I was okay. So I got a big bowl full of soup and ventured across the parking lot. It was larger than it looked. But I made it there before Chris had his burger. 11:30 and we still had a half hour to go. We cooled our heels until we could finally get into the hotel. “Well, what should we do then?” Chris asked. It wasn’t quite 10, and the motel said that we wouldn’t have a room until noon. It still wasn’t quite time for lunch, so we had yet another hour to kill. Wasilla had more places to shop than when I lived there. 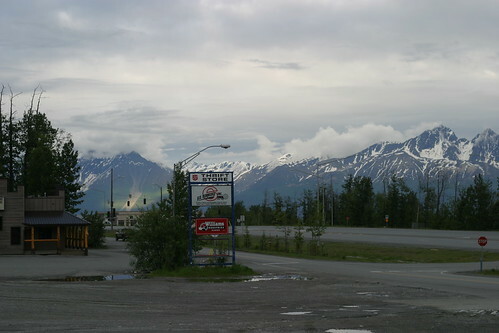 Wasilla has a right to be called, even if my no one else but me, the Strip Mall of Alaska. The ‘strip’ would be the Parks Highway, but still. They’d closed down the real non-strip mall of my youth, but in an early trend adopting move, they’d fully stocked the area with big box stores. A full Sears, a full Super Walmart, a Home Depot, the already discussed Carr’s grocery store. And then there is Fred Meyer’s. There had been a Fred Meyer’s in Anchorage for a long time, even when I was a teenager. But when I was an adult (barely) they opened it up to be a full service Fred’s. Grocery store! So that was ..gasp…15 years ago. And Fred Meyer’s has made a good relationship with Alaska. On their website they advertise bush delivery. Next day even, as long as the bush planes are flying. I had been wanting Chris to see the inside of a Fred’s. I’d described it to him before, but really, it was something you have to experience. Where we live now, Super Walmarts are feared and protested against. In fact, there was a long grocery store strike because the owners were tightening belts against the onslaught of Walmart carrying grocery-store items. The workers struck for cherry benefits, and it went on for months. In the end, the workers just gave up because unions have little-to-no power on the west coast anymore. Anyway, the Super Walmart idea is to have a full grocery store with dairy, produce and everything in the same store with all the usual Walmart things–which means everything. Chris and I had encountered a super Walmart on our trip to Yellowstone in Bozeman Montana. But Bozeman is small. And their walmart was small, comparatively. As a shopper, I was familiar with the idea of having everything in one store-BECAUSE I’D EXPERIENCED IT IN FRED MEYERS. In Anchorage. I thought it was a great idea, very convenient and it should come to Los Angeles already. I hadn’t been to Wasilla since the Fred’s opened there. I wondered what this one would look like. So I wanted Chris to see this. We wound our way back to the Fred Meyers and entered through the side next to the garden center. Garden center! Landscaping. My former city was civilizing itself. Hard to believe. So we went inside, and beheld a store that had a slightly more finished interior than a Costco. The floors were covered, not just plain concrete, and the shelved contained inventory that was not still Plastic-wrapped. But that was the extent of the polish. Directly in front of us were couches. Full upholstered, huge-armed couches that Chris and I had learned to associate with living rooms that were not cramped for space. To the right, we saw large packages of assorted fireworks. To the left, fishing tackle and hip-waders. We walked over to the couch. “Not bad.” I said. Further on we found an entire aisle of identical dining chairs stacked seat to seat. Further on was an aisle of insect repelling devices. We walked through aisles of dizzying diversity, took a right at the deli, bakery, and espresso counter and found the clothes. We looked through the ladies section, and though there was a large selection of large sizes, I couldn’t find the maternity. I guess it wasn’t an everything store after all. It occurred to me, while I was pondering my usual frustrations, that it might behoove me to find something else to do with my frustration. Like, you know, Jesus was surrounded by people who _I_ would have found frustrating. What was UP with those Pharisees? In power, and torturing the people with all these crazy rules that were not only distracting but harmful. And he did, every once in a while, give them the what-for. But not nearly as often as you might think. So, as I consider my reaction to frustrating…evil?…people, I think I would prefer to be more like Jesus. And then, I thought about how he handled it, as compared to how I handle it. I mean, I think I torture my friends by double-checking my reactions to thing. He didn’t need to get affirmation to know what he knew was right. Jesus was very confident. And maybe that can be a good thing to emulate. Not retreading worn ground. I know what’s right, and I know what’s wrong. I also know what is in my power to change, and what isn’t. Jesus was also kinda patient. So, I guess I should learn how to wait. Because endless frustration is not how I want to spend my time. I can just be confident that with patience the good things will come. Or at least I can try. So I have finished watching a Johnson&Johnson TV special called “The Ron Clark Story”. I include that it’s a Johnson&Johnson special because I want to make sure to convey the treacle that this story is filled with. Now, he is tried and tested and perseveres and all those troubled kids learn to do well in their end of the year standardized tests. I bought it. I bought it and kinda teared up more than once. It’s tried and true and it is so cliche, but I believe in what he’s selling. And I believe even more than the cliche. Why is it that teachers are the easy target? Why is it that this story has to be thrown so low and slow? Is it because no one could possibly disagree that CHILDREN need to be encouraged and nurtured and that CHILDREN are required to do their best, their best at all sorts of things that they don’t even enjoy, whether that be math or english, P.E. or learning to sit still while someone else is talking? Children must learn, because…because…Because they will need it when they become adults! I went to the library this week and got a book The Courage to be Brilliant. I am not usually inclined to self help books, but the title appealed to me. It rang true. I know that it takes courage to push to your best, to push past the people around you. It takes courage to face people that don’t want change, and don’t want you to challenge them. Did I say Challenge? Maybe ‘shame’ them it what I really mean. I read a bit of the book and felt pretty inspired. Let’s just say it’s been a rough month at work. On a lunch run, I brought it up. I work with this guy, so I knew it would end up like this. One of the things that the book says is that if you accept mediocrity in your life, it spills over. That mediocrity will pull. I have fought so hard to hard to acheive excellence..Brilliance?..in my workplace. I know the inertia I’m fighting against. And I don’t know if I’ll ever get very far. But Mr. Clark, you had it right. Dream Big and Take Risks. I say, that goes for everything. I want to achieve brillance in my creative work. But the 40+ hours I spend at my job will drag me down in all other areas if I don’t push for excellence there too. The kids in harlem didn’t have anyone rooting for them. And the people at work don’t even want things to get better. That’s not the point. Applause is not the point. I’m the point. Me trying and feeling good about myself is the point. Even though I am not in the 6th grade anymore. I showed Chris where to find the Palmer-Wasilla Highway. It’s not really a highway, just a substantial road (meaning two lanes with the occasional turn lane). Palmer was one of those deals. He persuaded a bunch of down and out farmers that Alaska couldn’t possibly be colder than the midwest in the winter, so why not go? He would give them a place to live and 40 acres for free. Remember, this was before Alaska was a state (1935). I cannot imagine why this would give the economy any kind of boost. But, hey, I wasn’t there. A bunch of families from Minnesota in particular, and surrounding states, came up to Palmer and were housed in a tent city to await their 40 acres (no mule). This was not what they had in mind. True, the winters in Palmer were actually less cold than the winters in Minnesota. But the SUMMERS! summers are far far far less warm. So far less warm that tent living was not a pleasure. Some of the people stayed. Many left. Palmer was peopled by folks who understood what a town was for and why it might be a good idea. Civilization was not something that the Palmer farmers were running from. Therefore, there were houses of a certain vintage in the area. Original Colony Houses. These houses had a kind of charm that made them very distinctive in their surroundings. They would have been unremarkable if located in North Dakota or Minnesota, but architecture and homeyness was scarce in Alaska. And a Carr’s grocery store and a McDonald’s across the street is around the corner. Palmer did not have a mall, or the many big box stores that Wasilla has. “This does look a little more like a town,” Chris admitted.